Scientists show phylogenetic relationships by drawing phylogenetic trees. If you trace the process of speciation on paper, you end up with a branching pattern that's referred to as the tree of life. Each branch in the tree represents a speciation event, when one species evolved into another. The easiest way to explain phylogenetic trees is to start with the simplest tree possible: one with three species, which I'll call species A, B, and C.
Imagine that you know that species B and C are more closely related to each other than either of them is to species A. More specifically, species B and C have a common ancestor that they don't share with species A. All three species also have a common ancestor that dates from a time before the common ancestor of species B and C. A phylogenetic tree for these species would look like the one shown on the left in Figure 9-1. Plug in species names, and you have the tree shown on the right. Two very simple phylogenetic trees. Most phylogenetic trees are not as simple as the one in Figure 9-1, of course. A more realistic (and complex) tree appears in Figure 9-2. 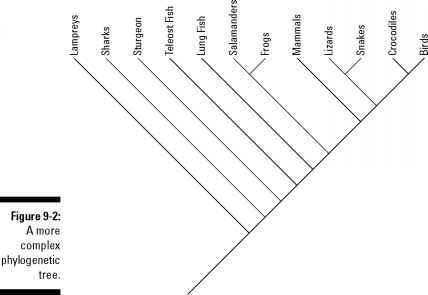 This tree shows the relationships among some of the major vertebrate groups. Located at the tips of the branches are the names of the groups (lampreys, sharks, sturgeons, mammals, birds, and so on). As stated earlier, Figure 9-2 shows the phylogeny, or evolutionary relatedness, among some of the major vertebrate groups. Strictly speaking, however, the scientific convention would be to refer to this diagram as a phylogenetic hypothesis rather than a phylogeny. 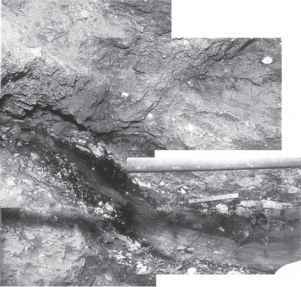 Not having been around that many millions of years ago when these relationships were forming, modern scientists can only infer how these things evolved; they can't state it directly.